Scientists hope to employ networks of “dark fibers,” unused fiber optic cables, in order to sense sound waves moving underground—the signals of earthquakes. 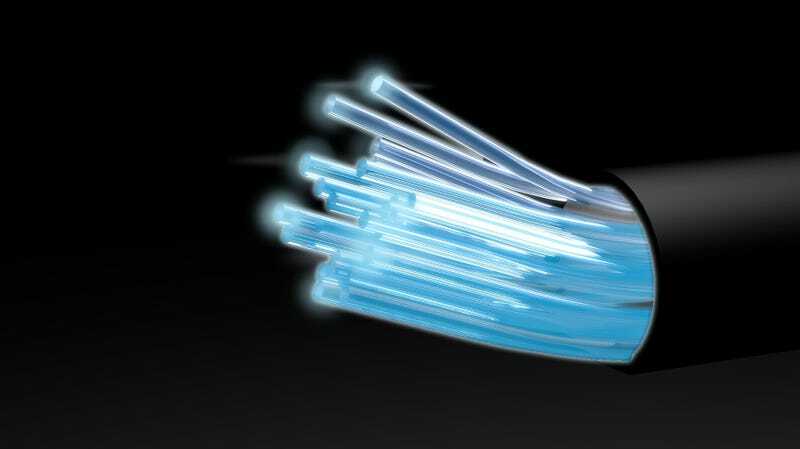 Some millions of miles of fiber optic cable lay unused beneath the ground. Researchers from Lawrence Berkeley National Lab and the University of California, Berkeley tested out a new technique that could offer higher-resolution measurements of movement in the Earth’s crust than current seismic detector networks. Measuring vibrations through the Earth’s surface is a spotty endeavor—some seismically active places have lots of sensors, while places far from tectonic plates may have only a few. This can make it difficult to measure seismic activity in areas with fracking-induced earthquakes, for example. Other teams of scientists have recently developed “distributed acoustic sensing,” which uses laser pulses in order to detect teeny vibrations along the fiber. Researchers place units called interrogators along the fibers, which send out and detect short infrared laser pulses. Tiny strains on the fiber induced by seismic activity cause some of the laser light to reflect and bounce back to the sensor. Sending rapid pulses allows the scientists to determine changes in the light scattering over time, and knowing the speed of light lets them determine where the seismic activity occurred. Here, the researchers tried the distributed acoustic sensing technique out in the real world. They plugged their interrogators into the fiber line along the Department of Energy’s Dark Fiber Testbed, 13,000 miles of telecommunications fiber in the western United States that is used for testing new communication equipment. The researchers looked specifically at a 27-kilometer (17-mile) segment near West Sacramento, California, and took data from July 28, 2017 to January 18, 2018. The team was able to extract information on the speed of waves traveling through the Earth’s surface—they even measured the devastating earthquake that occurred in Mexico during the study time period, according to the paper published in the journal Scientific Reports. They were hoping to use the method to determine the location of groundwater, one of the goals of the paper, but were unable to do so, said Ajo-Franklin. But they were able to measure passing trucks and trains. “We were able to build a train timetable because we could detect it in the fiber optics,” he said. This experimental technique isn’t ready for application beyond research yet; Ajo-Franklin pointed out plenty of limitations. A single sensing location along the line is less sensitive than a single seismometer, and can only measure strain on the fiber in one direction, though he pointed out that sensing locations would be more closely spaced and far more numerous than present-day seismometers. It also produces a ton of data—128 terabytes in just three months—which can be difficult to manage, store, and sift through. But more importantly, one experimental unit only works along 30 kilometers or so of fiber cable, which would probably prohibit using this method on underwater lines in the near future, where there might not be as many locations to plug in the interrogator. He hopes that recent and upcoming advances in laser science will soon allow for measurements over longer distances.